There are three knee bones that make up the joint. The Femur (thigh bone) runs from the hip to the knee, the Tibia (shin bone) runs from the knee to the ankle, and the Patella (kneecap) is the small bone at the front of the knee. 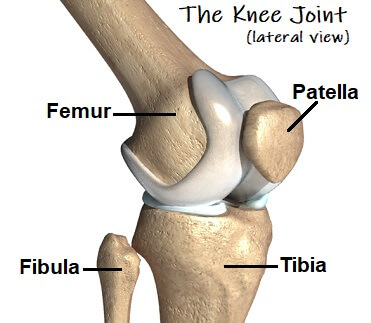 The femur and tibia join together forming the tibiofemoral joint, and the kneecap rest on the front of the femur, known as the patellofemoral joint. Another bone, the fibula, is found on the outside of the leg. It is not directly part of the knee joint, but many of the important structures of the knee attach to the fibula. The bones of the knee are all lined with cartilage and whole joint is surrounded by a joint capsule. Here we will look at the different knee bones and associated structures and how they work. You can also find out what can go wrong with them and how to treat any problems that may arise. 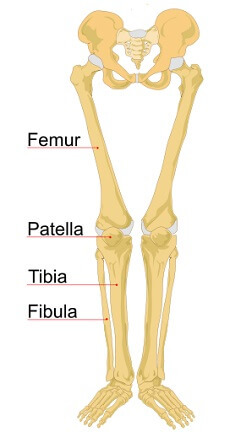 The femur is the largest bone in the body and at the knee it joins to the shin bone (tibia) and the knee cap (patella). On the end of the femur are two round knobs known as the femoral condyles which rest on top of the shin bone. Between these knobs is a groove called the patella groove where the knee cap sits, allowing it to glide up and down freely. The top surface of the tibia is basically flat and is known as the tibial plateau. The femur sits on this flat area. The top of the tibia is lined with an extra layer of cartilage, known as the meniscus. Damage to the cartilage is a common cause of knee pain and may be due to a cartilage tear or arthritis. The patella is a small upside down triangle-shaped bone. It sits inside the tendon of the thigh muscles (quadriceps) at the front of the knee resting in the patellar groove of the femur. A great deal of pressure goes through the kneecap and it is therefore lined with the thickest layer of cartilage in the body. Common problems around the patella include chondromalacia patella, housemaids knee and patellofemoral pain syndrome. The most common injuries are dislocations or fractures of the kneecap - you can find out more in the kneecap injuries section. The fibula is often mistaken as being a knee bone. It is a thin bone that runs down the outer side of the lower leg. It is not technically part of the knee joint but it is joined to the tibia by muscles so can be involved in various problems in the knee. Each of the knee bones is covered in a thin layer of articular cartilage. It lines the bones providing some cushioning and allows them to slide smoothly on each other without friction. The meniscus is a much thicker specialist layer of cartilage unique to the knee joint. It supplements the articular cartilage to provide extra cushioning. Damage to the meniscus is a frequent cause of knee pain - find out more in the knee meniscus section. The capsule is like a bag that surrounds the entire knee joint and attaches to the knee bones. It contains fluid (called synovial fluid) which lubricates and nourishes the joint, like oil in your car engine. This fluid is constantly replenishing itself, especially during movement of the knee. If you have been sitting or sleeping for long periods, the capsule can dry out making movements painful initially. 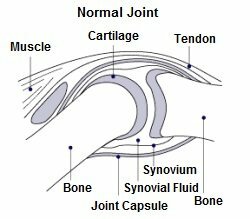 As you move the knee, it starts to pump synovial fluid into the joint capsule and stiffness and pain settle down. Morning stiffness in the knee is a typical symptom of arthritis, due to the drying up of the synovial fluid. If you have enjoyed learning about the knee bones and would like to know more about the other structures that make up the knee, including the muscles, ligaments and meniscus, visit the knee anatomy guide. If you are suffering with knee pain and want some help working out what is causing your problem, visit the knee pain diagnosis section.